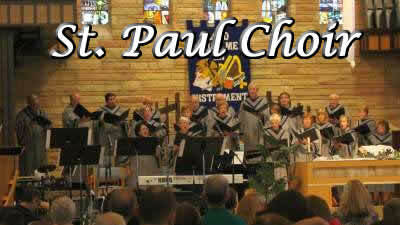 Click the image below to see Events & Happenings at St. Paul! Greetings, we are excited to bring you some updates on our outreach projects. Without your support none of this would be possible. Thank you again for allowing us to serve others. We lovingly support our St. Paul Senior Community, Ecumenical Community Food Pantry, Franklin Neighborhood Association, Hoyleton services for children and Emmaus Homes for the developmentally challenged. We also support our conference DuBois Center and church-related Eden Theological Seminary. As a congregation within the United Church of Christ, we gladly support our denomination and national ministries, plus a variety of world missions through Our Church’s Wider Mission and the One Great Hour of Sharing. WE BELIEVE ALL PEOPLE MATTER TO GOD and are welcome here. God, the designer and crafter of all, created all humanity in God's own image thus making us siblings in the family of life. WE STRIVE TO BE SERVANTS in service to others. God, the redeeming Christ, calls us to love one another as he has loved us. WE NEED CHRISTIAN EDUCATION for good faith and life. God, the eternal spirit, nurtures us continually toward the realization of God's vision of heaven on earth. “They shall know we are Christians by our love.” We follow Jesus’ commandment to “love each other” from birth to death and blessed memory. We support baptism at any age along with staying With You through illness or in times of special need. Our With You ministry provides visitation and chore services in coordination with our pastors, who visit and officiate at weddings and funerals. “The more we know, the better it gets.” St. Paul has a historic commitment to education for all…and all ages! Children as young as two years old are served by our Mothers’ Day Out preschool. Our children and youth opportunities include crafts, classes and camping experiences plus Confirmation and music programs. Adult education is founded on the Forum, our after-worship enrichment hour that offers a variety of faith-supportive topics. 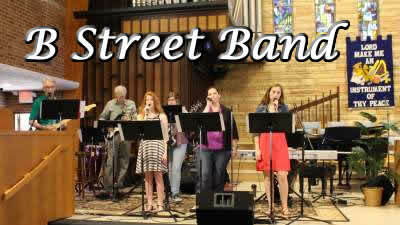 It’s been said that “Music is the voice of God.” We experience this in harmony with our B Street Band and Chancel Choir in addition to our Glory Ringers. We inspire our neighboring community with our Fine Arts series and long-time partnership with the Masterworks Chorale. There’s something for all ages since “God is still speaking” through our ministries of music!